So this is the second song from “…Like Clockwork” on the list. I’ve mentioned in my other entry “The Vampyre of Time and Memory” at no. 38 that this album was a very slow burner for me. The whole album is so dark, so different and, frankly, difficult to get into. 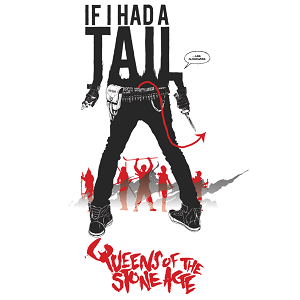 When I think of QOTSA I think of fantastic and imaginative riffs, boppy hard rock tracks and on occasion some fun but always in a clever way. Yet this song, this album generally is so moody, so sluggish and takes a real effort to take in. But once you do, if you’re willing to give it that chance and not treat it like every other QOTSA you’ll be rewarded big time. “If I Had a Tail” for me epitomises this album. Sure it’s Queens. You can hear Josh Homme’s very distinctive vocals, those guitars sound familiar. But it barely hits second gear, it drags along all the way to the end. But the beauty behind the song is the claws that are dug in to make things slow; it’s got some real teeth and there’s a real density to the song that few Queens track have. And that’s saying something because generally Queens songs are full of flavour and depth. Josh Homme’s howling at the end of the song are both haunting and beautiful. The way the song ends almost abruptly feels like a tease because you almost wish you were being dragged further despite it being a difficult ride. It’s just a great song that has an unexpected bite to it and I love it. If you missed #24 go here.